a great many wrong-cultured others. —from "The Return of Colored Only"
Skin, Inc. is Thomas Sayers Ellis's big, ambitious argument in sound and image for an America whose identity is in need of repair. In lyric sequences and with his own photographs, Ellis traverses the African American and American literary landscapes—along the way adding race fearlessness to past and present literary styles and themes, and perform-a-forming tributes for the Godfather of Soul, James Brown; the King of Pop, Michael Jackson; and the election of President Barack Obama. Part manifesto, part identity repair kit, part plea for poetic wholeness, this collection worries and self-defends, eulogizes and casts a vote, raises a fist and, often, an intimidating song. One sequence is written as a sonic/ visual diagram of pronouns and vowels; another quotes from editors' rejections of his own poetry included in the book; another poem, "Race Change Operation," begins: "When I awake I will be white, the color of law." 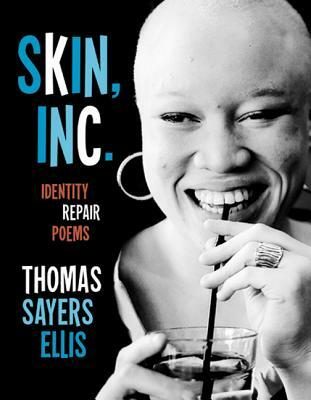 Skin, Inc. is the latest work by one of the most audacious and provocative poets now writing. Thomas Sayers Ellis is a poet and photographer. He is the author of a previous poetry book, The Maverick Room, and teaches at Sarah Lawrence College and in the low-residency program at Lesley University. He lives in Brooklyn. “Thomas Sayers Ellis is one of the most gifted poets of his generation and more. He reminds me of the ancient Greek bards who found poetic and theatrical vehicles to comment on contemporary politics and society-those great intellectuals and artists Athenians turned to when they wanted something closer to the truth than the official story. In this brilliant and penetrating collection, Ellis throws himself into the role of political bard, a voice of challenge and reason and utopia and warning in the age of Obama. Skin, Inc., is about repair and reflection, it's about coming to terms with history so we can move forward, not to a postracial future but an antiracist and ultimately postracist society. But he is less interested in recounting our histories of oppressions than in our creative capacity, the black roots of a unique prosody, and the power of poetry and the poet to speak to beauty, grace, perseverance, in the face of violence, enslavement, commodification.